WOW! Women On Writing Blog: Creativity over Time: Reinvent Yourself or Keep on Going? Creativity over Time: Reinvent Yourself or Keep on Going? Today, I have no answers for you, no wisdom, just questions. I’ve been thinking about the mature phase of creativity and how creative people change or don’t change over their careers. 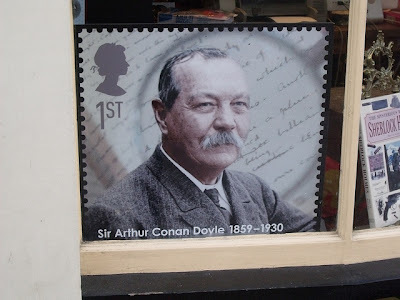 For example, Sir Arthur Conan Doyle tried to kill off Sherlock and then had to bring him back because Doyle wasn't as successful at other stories. At one point, Garrison Keillor tried to leave Prairie Home Companion behind, but eventually he returned to his successful creation. On the other hand, Sean Connery has reinvented himself several times from 007 to other action-oriented characters; Harrison Ford reinvented himself from Han Solo and then reinvented Indiana Jones into a thriving, eclectic career. Why can some people reinvent themselves and some get stuck in a rut? What is the difference? Luck? Or, why should some people NOT reinvent themselves? Garrison Keillor's contributions, Doyle's contributions--what more could you ask from a person, they have changed our lives? Should we ask that they change our lives in multiple ways? What can creative people learn here? Get in a groove and work it? Get out of the groove and reinvent your career? After a few successes in writing or any creative field, the questions loom. What next? What is the next step you should take? And I hear both sentiments: take a risk or keep following the track that has led to success. I have no answers, just questions. Which path do you find more appealing and why? Do you want to keep doing what you’ve been doing? Or do you want to reinvent yourself several times over your career? I'm on two different paths--almost. I've had a few Chicken Soup stories published/accepted, along with a few Not Your Mother's Book stories accepted, so I'm continuing to submit to those two publishers, along with Sassee magazine. However, I'm trying to branch out. Trying. I submit to contests, I'm working on a couple of things that are outside of my box, and am formulating an idea on a piece of historical fiction to work on for NaNoWriMo. I didn't start out my life with reinvention on my mind but it turned out to be the theme in my life. Fate was always pushing me down some path I hadn't selected. There were a few moments in the past when I wished with all my might to do the same thing day in and day out. It wasn't meant to be. Then I was involved in an international scandal (the fringe) but still, I was there and feeling a heck of lot like Dorothy. Now, I just accept that it's part of my journey and go with the flow. Maybe one day I'll settle down into one me, until then I hang on.